Primitive Large Oval Set of 5 Stacking Boxes. Love the primitive nature and theme of this stack box set. Warm rich colors of Black, Burgundy and Mississippi Mud, perfect colors for primitive decorator. Use for storage and display! Nice larger size boxes. 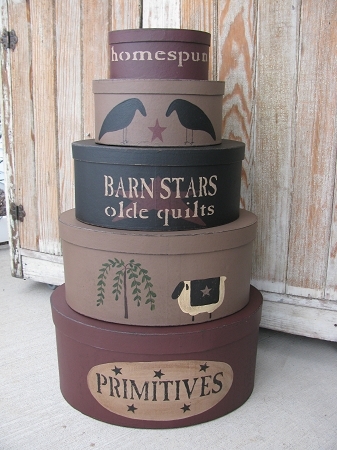 All boxes are distressed slightly and stained for a primitive worn look. Size is 25 1/2" tall when stacked and bottom box is the largest measuring 11"x14". Hand painted, designed and signed by Heidi.